The Integrated Precipitation and Hydrology Experiment (IPHEx) is a ground validation field campaign that will take place in the southern Appalachian Mountains in the eastern United States from May 1 to June 15, 2014. IPHEx is co-led by NASA's Global Precipitation Measurement mission, with partners at Duke University and NOAA's Hydrometerological Testbed. The field campaign has two primary goals. The first is to evaluate how well observations from precipitation-monitoring satellites, including the recently launched GPM Core Observatory, match up to the best estimate of the true precipitation measured at ground level and how that precipitation is distributed in clouds. The second is to use the collected precipitation data to evaluate models that describe and predict the hydrology of the region. 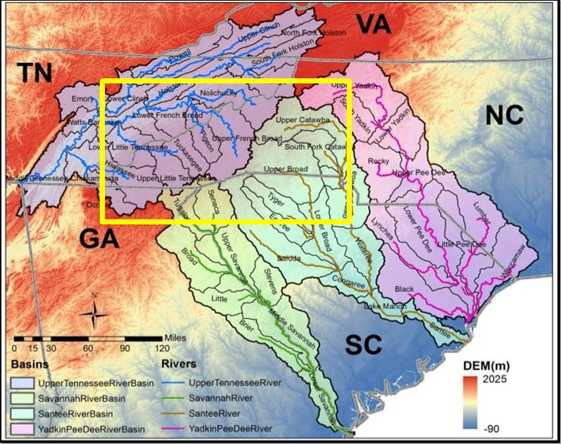 These models are used for predicting how much water is available in rivers and aquifers, for resource management and for flood and landslide prediction in the Upper Tennessee, Catawba-Santee, Yadkin-Pee Dee and Savannah river basins. A number of instruments in the region already measure rain from the ground, and this campaign will add more. In the Pigeon River basin on the North Carolina side of the Upper Tennessee watershed and the Catawba River Basin in North and South Carolina, rain gauges, stream gauges, instruments called disdrometers that measure drop size, soil moisture sensors, and other equipment will measure rainfall. The NASA Polarimetric weather radar (NPOL) and the Dual-frequency, Dual-polarimetric, Doppler radar (D3R) will be located on a cattle ranch in southern Rutherford County, North Carolina just across the Carolinas' border and north of Spartanburg S.C., and the NOAA X-band polarimetric radar (NOXP) will be located on a ridge above the Pigeon Basin. These radars will take measurements of the air column above the river basins. Other smaller radars throughout the study area will get radar coverage of the region that’s as good as possible, given the challenges of the mountainous terrain. In addition to the ground measurements, NASA's ER-2 plane will fly above with instruments to simulate satellite measurements, and the University of North Dakota's Citation aircraft will fly inside storms to measure raindrops and precipitation particles inside clouds. Data from satellite overpasses will also be included. Together all the data will be used to improve rainfall estimates from the GPM Core Observatory and other precipitation satellites. Extended IPHEx domain showing the river basins under study. In clockwise direction: Upper Tennessee (purple, 56,573 km2), Yadkin-Peedee (pink, 46,310 km2), Catwaba-Santee (blue, 39,862 km2), and Savannah (green, 27,110 km2). The yellow rectangle denotes the Core Observing Area where ground validation efforts will be concentrated from May 1 to June 15, 2014. Precipitation that falls over mountain ranges – the Appalachians, Rockies, Andes, Himalayas, Alps – ultimately supplies the majority of freshwater for people and agriculture in many parts of the world. Mountain regions accumulate snowpacks in the winter that melt in the spring, and they serve as the headwaters for rivers, which supply everyone downstream. Sometimes large accumulations of precipitation falling on the slopes of mountains can also be a threat to life and property when the rain rapidly runs off into streams and rivers, causing local flooding and landslides. Measuring precipitation in these areas is therefore crucial for not only managing water resources and the environment, but also for protecting people and property. However, the precipitation patterns produced by mountains are complex and difficult to understand and predict, due to the peaks’ high elevations and rugged terrain. Ground measurements are limited because setting up rain gauges involves hiking in and maintaining equipment in difficult to reach isolated regions terrain. Ridges block weather radars from making observations before they can see very far into the mountains. Current satellite-based measurements and radar observations from space also need improvement. Large biases exist for both heavy and light precipitation events, either under or over-estimating how much rain has fallen. These biases occur because the processes by which rain and snow form and move through mountainous regions is not well understood.